Even though I haven’t discussed fracking lately it is still very much in the news. Over the weekend it was revealed that what appears to be a handbook for conning (or convincing) landowners to sign leases for natural gas drilling was found by a Greene County resident near her driveway. The handbook outlines tactics and talking points for “landmen” or door-to-door energy company representatives. It paints Ohio residents as friendly but gullible and advises the representatives to deal with the men whenever possible warning that the women will ask more questions and the men are more likely to sign. It also instructs the landmen not to mention groundwater contamination or lost property values and to downplay natural gas drilling and rather emphasize they are drilling for oil. It also says to describe the hydraulic fracturing drilling process (fracking) as being radioactive free even though it concedes that it is not. Many Greene County residents and environmentalists feel the memo belonged to Jim Bucher, a landman for West Bay Exploration Co., based in Traverse City, Mich.; however, executive vice president Tom Stewart of the Ohio Oil and Gas Association is convinced the memo is a hoax backed by the environmentalists. Laura Skidmore,who found the memo inside a binder, said she was stunned by the contents. Residents say many of the talking points outlined in the memo were used by Bucher in his talks with the residents. Beginning last fall Bucher began sending packets containing lease documents to Greene County residents and followed up with home visits and phone calls. Meanwhile, local environmentalists were busy educating the public as to the hazards of natural gas drilling and fracking and the documentary Gasland was shown at the local theater. Please click on the link above and read the memo—it is quite an eye-opener. Also in the news, big figures are being thrown about by oil and gas companies. The Chesapeake Energy Company said it expects to generate $15 billion to $20 billion from drilling in the Utica shale in eastern Ohio. For a comparison, Ohio had $665 million in oil and gas production in 2009. These are figures from only one company but several other companies are also planning to enter the state such as Devon Energy, Anadarko Petroleum Corp. and Chevron Corp. These figures from the Oklahoma based Chesapeake Co. are significant as they represent the first estimates related to the Utica shale in Ohio. 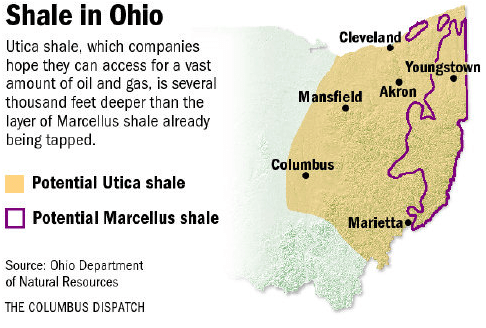 The Marcellus formation is already producing returns in the southeastern part of Ohio, Pennsylvania, and nearby states. These formations have previously been inaccessible but with the introduction of hydraulic fracturing or fracking the rich gas can now be harvested from the shale. The Utica shale is several thousand feet below the Marcellus layer and runs across the eastern half of the state, including the Columbus area. “There is a great deal of potential, but it’s really hard to determine how big it will be,” said Jerry Jordan, chairman of Knox Energy in Columbus. His company owns about 500 oil and gas wells in central Ohio. If the Utica lives up to its promise, Knox is one of many local businesses that stand to share in the windfall because of existing lease rights. Jordan, 75, comes from an oil-business family, and he has been in the business all of his life. That experience, along with his training in geology, makes him skeptical when big numbers are thrown around. He points out that most of the state’s oil and gas companies are family owned and cannot compete with larger corporations who can afford to drill deeper into the Utica layer and maintain a series of wells. This could mean most of the profits will go to larger companies out-of-state. However, as I have written about previously, this process comes with many risks including contamination to air and water including ground water and drinking water. In addition, the EPA has raised concerns about the disposal of the liquid waste that is a byproduct of fracking. “We’re really pretty far from where we need to be in order for this activity to take place in Ohio, to protect our natural resources and community health,” said Ellen Mee, director of environmental-health policy for the Ohio Environmental Council, an advocacy group. She urges the state to look at what is happening in other states. She also points out there is now more doubt about shale gas than publicly portrayed. A report was published in the New York Times citing internal emails from the industry voicing doubts. I’m hoping this is one promise a politician can keep. I am not entirely against harvesting this resource. After all, I like an environmentally controlled house that is cool in the summer and warm in the winter just like everybody else. And we all agree this state could use another source of income. But I also want to know that the air we breathe and the water we drink is safe and clean. The challenge before our state leaders and citizens is to make these two elements compatible. Can we harvest this natural resource in a safe and clean manner without harming our environment? The challenge is now before Ohio to make us a leader in the field.